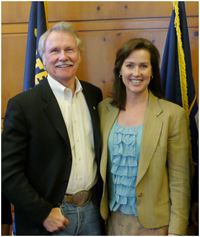 Kitzhaber and Hayes, a question of judgment. The Oregon Government Ethics Commission is wasting its time with its newly launched inquiry into the consulting work of Governor Kitzhaber’s longtime girlfriend and now fiancee. Unless the facts differ from what has been widely reported, this was not a question of laws being broken. It was a matter of lousy judgment on the part of the governor and Cylvia Hayes. The story is that she was pursuing and received consulting contracts with various environmentalist interest groups while she had a semi-official role in the Kitzhaber administration as well as a close personal one in the governor’s life. She passed herself off as Oregon’s “first lady” and reportedly had a desk in the governor’s office. This was an improper arrangement, but it was not illegal. The law bars public officials and employees from using their office or employment for private gain other than their pay. But Hayes was not on the state’s payroll, as far as is known. She had not been appointed or elected to anything. The source of her arrangement with Kitzhaber was strictly private and personal, and any influence she had over state policies or agency actions was the result of her intimate relationship with the governor. As a private citizen, she was free to pursue any contracts or sources of income she wanted. It was Kitzhaber who should have seen that it was an abuse of a sound principle — don’t mix personal affairs and business — to give his girlfriend a role in his administration if she was going to get paid by outsiders to affect, directly or indirectly, state policies. It was the governor who should have seen the conflict and taken steps to stop it. Maybe he didn’t see it because he didn’t want domestic strife. (One of his staffers did raise questions and was forced out.) Or maybe he didn’t object because he and Hayes agree on the causes she is promoting. This sentence in your above post stood out to me: “One of his staffers did raise questions and was forced out.” If true, this strikes me as more than an ethics question. As you noted however, Portland, Corvallis, and Eugene (and I would include Salem), littered with public employees, have made their self-serving wishes prevail. Craig Ziegenhagel commented on Facebook: “What really makes it a waste of time is that he appointed most of the members that serve on the Ethics Panel. It needs to be deeply looked in to by a more neutral agency. It is a sad state of our times that someone with the clouds floating around him that he can be re-elected. Liberals seem to support their candidate no matter what. If he was a Republican they would be calling for him to step down and would have called for him to remove himself from the race for governor. I hope he is aware that about 50% of the people in this sate also did not vote for him. I have seen a couple comments about liberal vs conservative and Democrat vs Republican and that irks me a little. This issue is not, and should not, be cast as a partisan problem. Many bad things have been done by both parties and we should concentrate our efforts on removing the behavior regardless of part affiliation. My hope is that this Commission will look into this situation. They should demand to see all emails, all correspondence related to Hayes, her assistant and the Governor. They should take their time and get it right. Then they need to propose that Oregon avoids any contact with companies that have paid Hayes in the past. This propositon would protect the Governor, the state and my tax dollars. As an added benefit, it would add legitimacy to Hayes’ ability to make money because she is good at what she does, rather than who she can influence.